During the last few days I had a look at the ePub format — the format to go if you want to offer something on an eBook reader. It looks to me like we are back at webdesign-square-one — only now it’s not a battle between Netscape, Explorer, and Opera, but between different hardware devices. After some interesting (and time-wasting) experiences with InDesign and its (lack of) ability to help you create ePub files (it can, but you need to edit them manually afterwards), I think the ePub version will take at least two weeks. What bugs me is not only that ePub makes it hard to format a book like a PDF (okay, that makes sense, the screen sizes differ), but that I have to adapt the content to it. For example, tables — while looking beautifully in the PDF — are of no use in an ePub book. So I can reformat the text and turn tables into bullet point lists (yeay!). Because while I so want to finish this project, I also want a version that looks good and can be read on almost any device. And for that, I cannot simply transfer the created PDF. So, I am looking around for a way to offer the PDF as eBook (currently, there is “only” the two-page-spread available here), because frankly, the 1-page version looks stunning on an iPad. Seriously. It is how the book should look like, in brilliant color and detail. The ePub version will be different, same content but different formatting. Hmm, and I can say that I have learned a lot about publishing and book formats in the last few days … some vacation, but, well, instead of pictures of tropical islands I have a book … and soon an eBook … until then, have fun with the webversion of “Organizing Creativity”. 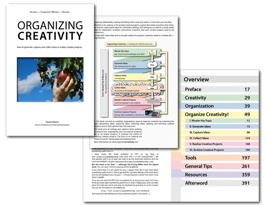 Categories: Book Information, Organizing Creativity 2nd Ed. 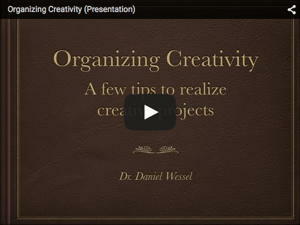 next older posting: “Organizing Creativity” (2nd Edition) is available!